With an accuracy of 0.015% of reading, 0.001 mA resolution, and 1 microamp step resolution, the PCL120 has the highest precision in its class. Other features that make the PCL120 stand out include a "% error" function, which eliminates manual error calculation and allows the display of actual versus ideal error at any calibration point. 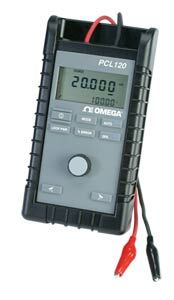 The PCL120 can simulate, power, and measure 2-wire transmitters. Its automatic step and ramp functions enable remote calibration of 4 to 20 mA devices. The PCL120 has many innovative, powerful features that make calibration easy. A few clearly marked keys give the user access to the full functionality of the unit. The STEP and RAMP output modes automate either a discrete 4-8-12-16-20-16-12-8-4 mA stair step output or 2 speeds of a linear 4-20-4 mA ramp output. Pressing the AUTO key (1) activates this time-saving function. To further aid remote calibration, the PCL120 features a minimum/maximum value recall function. In the measure mode, holding the AUTO(/MAX) key (1) gives a direct readout of the maximum value, while holding the 25%(/MIN) key (4) gives a direct readout of the minimum value. Holding the % ERROR key (2) while turning the large knob provides instant feedback on the difference between the ideal and actual current values required for a given device response. This tells the user whether the device is within its accuracy range. No further calculations are necessary. A LOOP POWER key (3) provides instant 24 Vdc loop power output. The 25% (4) key provides instant outputs of 4, 8, 12, 16, and 20 mA loop current, with increments occurring each time the key is pushed. Nota: Comes with test leads, 9V battery, calibration certificate, flexible protective sleeve, and complete operator’s manual.